With contractors and broadacre farmers facing significant challenges finding skilled operators, Case IH has recognised the value of equipment which is easy to use. The company's latest harvesters, balers and tractors are designed to deliver maximum precision and productivity without being overly complex to operate. "Skilled agricultural equipment operators are becoming increasingly harder to find, particularly as the WA mining boom has created a lot of job opportunities which have taken workers out of the field," says Geoff Rendell, Case IH Hay and Harvest Product Manager. "The solution to the skills shortage has to be multi-angled, including education and incentive packages, and also looking at new ways of getting the job done. 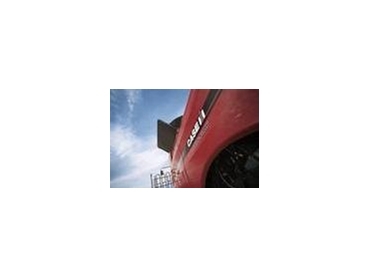 Case IH is helping with that third tactic by developing equipment which features a range of automatic settings to make tasks easier for the operator to complete, and by making our machinery more efficient, so a single operator can achieve more." For example, the latest AFS Pro auto guidance system will allow operators to set guidance paths from Google Earth Coordinates. "The machine does not even need to have been in the field when the guidance lines are set up, so header contractors can set guidance lines offsite, before they even get to the farm, and can run multiple combines on the same guidance pattern," Geoff says. New 2009 model Magnum and Steiger tractors feature as standard an APM system which automatically adjusts engine speed and transmission ratio for maximum fuel efficiency. "The system has demonstrated fuel savings up to 25 per cent for some applications - and with one button functionality, even inexperienced operators can work with optimum fuel efficiency while reducing fatigue." The latest Puma CVT tractor is also user-friendly, with joystick-operated hydraulics for ease of use and reduced operator fatigue. "The Puma is also offers great strength and versatility - it can go from spraying to harvesting to hay making with ease." In addition to the new tractors, Case IH will introduce two new large square baler models to the Australian market in 2009. The LB333 and LB433 will replace the current LBX332 and LBX432 models. "The new balers will assist with productivity and efficiency, with improved stuffer speeds and timing for more consistent bale shape and length, and improved fill on the bale tops and corners. Wider rear doors will allow for easier bale ejection and there are new monitor options, including the ability to use an existing AFS Pro 600. Along with the best-in-class knotter, new hard faced knives and updated styling, the new balers will be a valuable addition to the fleet." The new equipment launches complement last year's launch of a six model-range of new Axial-Flow combine harvesters. "The new Axial-Flow design includes a new chassis, new engine, new drive system and a new axle - but the harvesters are still built around the core Axial-Flow principles of gentle, crop on crop threshing that have made it the best choice for 30 years. The Axial-Flow has always enjoyed a reputation for quality and reliability that helps contractors and farmers to attract and retain the best operators."